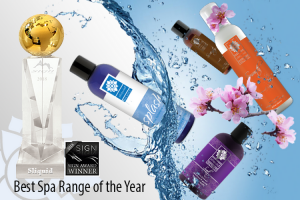 Top natural intimates manufacturer, Sliquid (www.sliquid.com) is proud to announce they have won the 2018 Sign Magazine Award for Best Spa Range of the Year for The Balance Collection. The Balance Collection is Sliquid’s line of award-winning Spa products. The Balance Collection features Splash Gentle Feminine Washes, Smooth Intimate Shave Creams, Sliquid’s natural nut & seed based Massage Oils, and newest edition SOAK. These Sliquid products are designed to help everyone feel their best before they get to the bedroom so it can be a relaxing, refreshing, rejuvenate experience with Sliquid. “We are always excited to win an award for our lubricants, but an award for our Sliquid Balance Collection is something new to us…and I have to tell you…it feels great! Having recognition given to our spa range, while in Germany, was the surprise cherry on top of an already successful showing at EroFame. We are honored to have this distinction under our belt, and we will continue to scale our entire product range with only the best and highest-quality products.” said Dean Elliott, Sliquid CEO. The newest addition to the Sliquid Balance Collection is SOAK. Sliquid Soak is a luxurious, all-natural bubble bath. Soak allows you to immerse your senses in this aromatic, foaming bath soak that is both soothing to the skin and gentle on the most intimate areas. Formulated without any of the harsh chemicals typically associated with bath products, SOAK is infused with natural sea salt, mango, shea butters, and decadent cherry blossom and lemon essential oils that create two distinct experiences. Cherry Blossom relaxes the body with floral notes, while Limoncello invigorates the senses with the bright scent of lemon. “We spend a good deal of time on product development in an effort to stay on top of market trends, as well as to bring new intimate products to our ever-growing customer base. Being presented this award represents the success of our journey from a leading lubricant line into a more comprehensive intimate products brand that addresses a wider variety of needs for our customers around the world.” Colin Roy, Sliquid Senior Vice President. Keep up with everything Sliquid by visiting the company’s official website www.sliquid.com. Follow Sliquid through social media on Twitter @Sliquid, on Instagram @_Sliquid, on Facebook www.facebook.com/sliquid.